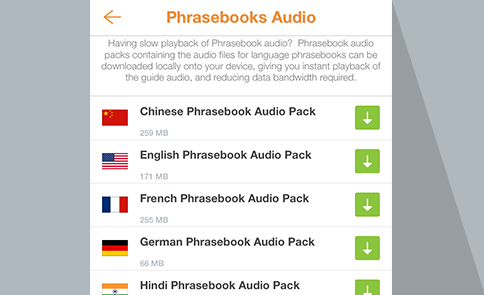 Phrasebook audio packs contain all the audio files used inside each language phrasebook. Downloading this locally to your mobile device will give you instant playback while reducing data bandwidth required on your mobile network. 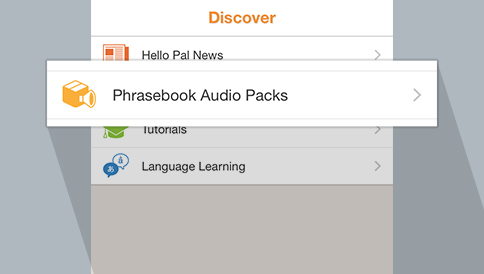 To download a phrasebook audio pack, tap on Discover in the main menu. Then tap on Phrasebook Audio. You will now see a list of available audio packs available. Select the language you want then tap on the green button to download the audio pack. WARNING: This is best done over a Wi-Fi network! Also make sure you have enough space on your mobile device to accommodate the download!